Saudi Arabian Oil Company (Saudi Aramco), one of the world's top oil exporters, will continue to boost its downstream presence in China, after it formalized plans to build a 300,000-barrel-per-day refining and petrochemical complex along with Norinco Group and Panjin Sincen in Panjin, Northeast China's Liaoning province, in February. "This is a clear demonstration of Saudi Aramco's strategy to move beyond a buyer-seller relationship to one where we can make significant investments to contribute to China's economic growth and development," said Amin H. Nasser, president and CEO of Saudi Aramco. "Our participation in the integrated refining and petrochemical project in Panjin will strengthen our collaborative efforts to enhance energy security, revitalize key growth sectors and industries in Liaoning and also meet rising demand for products and goods in China's Northeast region," Nasser said. The company has been strategically positioning itself in China and actively looking for partners in the country's downstream sector, as it shifts from an exporter of oil to an integrated player in oil, gas and petrochemicals. It has also announced a plan to acquire a 9 percent stake in Zhejiang Petrochemical, an 800,000-bpd integrated refinery and petrochemical complex, controlled by private Chinese chemical group Zhejiang Rongsheng Holding Group. The projects in Liaoning and Zhejiang have the potential to increase Saudi Aramco's participated refining capacity to over 1 million bpd in China alone. Figures from Bloomberg Intelligence reveal that Russia surpassed Saudi Arabia to become the largest crude oil exporter to China in 2016. Last year, China imported 71.49 million metric tons of oil from Russia while imports from Saudi Arabia were 56.73 million tons. According to Wang Lu, Asia-Pacific oil and gas analyst at Bloomberg Intelligence, the start up of new refining and petrochemical plants in China will support oil import growth in the 2019 to 2021 period. "The deals will help Saudi Arabia secure its crude oil market share in China," she said. According to Nasser, while the company is a major market player in the upstream sector, with an average of 1.2 million bpd exported to China in 2018 and an expected 1.5 million bpd during the first quarter of 2019, the energy behemoth is looking at further strengthening its downstream presence in China. Nasser said the company sees tremendous opportunities and has increased its exports to China, the world's biggest oil importer. China is a strategic partner for Saudi Aramco and one of the most important customers globally, and the company is looking at both the export of oil and integration down the value chain in the Chinese market, he said. With a share of 15 percent of China's oil imports last year, the company is looking at more integration down the value chain, as China is also a key growth market for petrochemicals. "Integration with refining is what Saudi Aramco and our partners are looking at, and these opportunities will help to expand our presence in China, achieving a better balance between our upstream and downstream business segments, considering how much we export to China," said Nasser. "We want to have a stronger position in the petrochemical sector in China, and we are actively working with our partners in these sectors, and the plan is to make investments in growth regions like Liaoning and Zhejiang where we can contribute to economic growth and development," he said. Nasser said the potential acquisition of petrochemical maker Saudi Basic Industries Corp, or SABIC, would also help the company strengthen its downstream sector in China. "If the deal materializes, our position in chemicals will expand significantly," said Nasser. SABIC is the third-largest chemical company worldwide, according to Forbes' annual ranking, with an excellent record and a footprint in different parts of the world. "It would be a great platform for Saudi Aramco to meet our aspiration to be a leading energy and petrochemicals company," Nasser said. 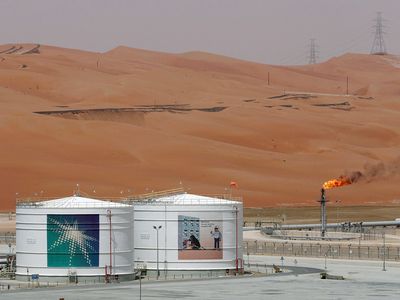 Saudi Aramco aims to buy a controlling stake in SABIC, possibly the entire 70 percent owned by the Public Investment Fund - the kingdom's top sovereign wealth fund. "Today we are the leading company when it comes to upstream. But our strategy, since we established our accelerated transformation program in 2011, is to be the leading company in oil, gas and petrochemicals, and for that we need an acquisition to achieve leadership in the petrochemical sector," he said. "Part of the company's strategy is to allocate 2 to 3 million bpd of crude to petrochemicals and expand our chemicals business globally," Nasser said. "China's demand growth offers exciting opportunities for Saudi Aramco and its partners."